Unique patterns fade only when wet. Pull-Ups Training Pants with Learning Designs for Girls feature unique patterns that fade when wet to help your toddler learn to stay dry. 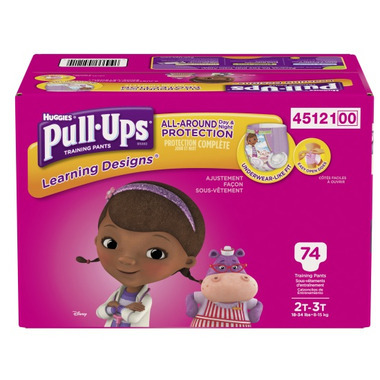 Pull-Ups potty training pants with stretchy sides allow kids to pull them on and off, and Disney characters help make training pants seem like Big Kid underwear. The easy-open sides make checking for potty breaks simple. Start your potty training routine today! * Packaging and characters may differ from picture. I really prefer these "training pants" to other products out there. The open sides are what really distinguish it from others on the market. They are also really absorbent so we are able to use them overnight and get our money's worth.